My spiritual and secular sojourns began early in my life. My journeys have been far and wide, and have taken me down forks, in circles or off the beaten path. The trips I’ve taken have enriched my life in many ways, and these in turn have enriched my Catholic family and my travel agency located on Long Island in New York. The many wonderful priests and deacons I’ve known along with my parish family at Our Lady of Mount Carmel Roman Catholic Church in Patchogue, NewYork have increased my fervor and helped me to become a better father and husband. They have also help me be the provider of a strong faith foundation for my family and a light to those around me. My wife Cathie and I are both travel consultants and we met on a travel professionals’ familiarization tour. We soon knew we were meant for one another, and felt that God intended us for each other. We have been blessed with twenty-one years of marriage and three wonderful children. And just like we have a great partnership in our marriage, we have a great working relationship at our travel business. As my faith grew, so did my desire to travel to the Catholic Holy Sites throughout the world. Consequently, I have been to the Holy Land (Israel) four times and in January 2012, I will be leading another Holy Land pilgrimage. It is awesome to walk in the foots steps of Jesus, our Lord and Savior. It never gets old no matter how many times I return to the Holy Land. 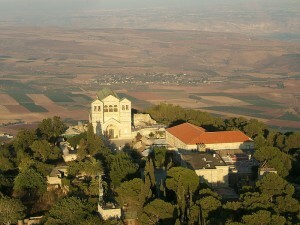 We have visited Bethlehem, the place of Christ’s birth, and Nazareth, where He grew up and became a young man. We have traveled to Cana where Jesus performed His first miracle, changing water into wine. We have traveled to Mount Tabor, where Jesus gave us the Sermon on the Mount, then on to the site of the Transfiguration of Jesus. We have walked the Via Dolorosa—Stations of the Cross—ending our walk at the Church of the Holy Sepulchre, the holy place where our Savior died to set us free from sin and death. Words cannot describe the overwhelming emotions we have experience on these Holy Land pilgrimages. And we have been blessed to participate in the celebration of Mass at many of these holy sites. As a travel consultant, I have been blessed to go on other Catholic Pilgrimages as well. This year I have traveled to the Shrine of Our Lady of Good Help where the Queen of Heaven appeared in October of 1859 to a young girl named Adele Brise. Directly underneath the church building on the site is a grotto marking the spot where Mary appeared to young Adele as she was walking to the flourmill with a sack of wheat on her shoulders. In the grotto there is a beautiful statue surrounded by hundreds of burning candles. The shrine received the approval of the Holy See In December 2010, and is the only approved Marian apparition site in the United States. It is located just outside Green Bay, Wisconsin. Each time I go on a pilgrimage my faith is strengthened and deepened. I look forward to leading more pilgrimages, especially to other Marian sites such as Lourdes, Fatima and to Our Lady of Guadalupe in Mexico City. If you have never been on pilgrimage, you really should try it! The life of a Catholic traveler is truly full of wondrous sojourns and opportunities to grow in faith.